Barred owls like this one, seen peering through Westborough’s summer foliage, are year-round residents and begin courting at this time of year. Males and females look alike, but females are about 30 percent heavier. Barred owls are medium-sized owls, about 21 inches long with a 3- to 4-foot wingspan. Most of us are careful not to let January’s mild weather fool us into thinking about spring, but barred owls are among the Westborough residents already preparing for spring. Taking their cues not from the weather but from the lengthening days, male and female barred owls (Strix varia) begin courting around this time of year, in February and March. These owls form long-term pairs, and unless winter prey is scarce, male and female tend to live year-round in home ranges that overlap. As the two get together for the breeding season, they spend more time together than they do in fall and winter. If you walk in the woods, you might hear barred owls, even if you don’t see them. They’re sometimes called hoot owls, and for good reason. They are more vocal than most other owls, and it’s possible to hear them at any time of year, even during the day. They become more vocal than usual as the breeding season approaches and they announce their territory. A courting pair will also hoot back and forth in a kind of duet. They become quieter once their eggs are laid, between mid-March and mid-May, but then they become especially vocal again in late summer and fall, probably when the young are leaving the area. The hoots are low in pitch. Low sounds carry better than high ones in the forest, which tends to muffle sound. This owl is one of about 60 barred owls brought each year to the Wildlife Clinic at the Tufts Cummings School of Veterinary Medicine in Grafton. There they are treated for injuries, typically from motor vehicles. This owl is looking backwards – something it can do because owls have very flexible necks that allow them to turn their heads 180 degrees, or half way around. The owl’s tail has been taped to reinforce it and protect the feathers while the owl is confined during treatment. Besides interfering with sound, forests can also interfere with flight. For this reason, barred owls have short, broad, rounded wings, which make these owls slow but maneuverable so they can fly and hunt in the woods. Other forest birds of prey, such as Cooper’s hawks (Accipiter cooperii) and sharp-shinned hawks (Accipiter striatus), have wings with a similar shape. Like most owls, barred owls hunt primarily at night, as well as at dusk and dawn. They use their good night vision and keen hearing to find prey. They typically sit and wait for prey, and then drop down on it, grasp it in their talons, and swallow it whole if possible. They go after small mammals, including voles, mice, squirrels and rabbits, but also regularly take birds. They also catch snakes, amphibians, and fish. If hunting is good, they might store their kill in a tree, perhaps on a pine branch or in the crook of a branch. We don’t often see barred owls, even though they live in our area year-round. These forest birds keep away from areas with people. They favor large, unbroken areas of forest, with older, larger trees. In contrast, great horned owls (Bubo virginianus) are larger and hunt similar prey, but are more active around forest edges, which are plentiful in developed areas. Barred owl adults and young sometimes become prey for great horned owls. People in Westborough may not see barred owls very often, but just down the road at the Wildlife Clinic at the Tufts Cummings School of Veterinary Medicine in Grafton, the veterinarians see quite a few of them as patients. 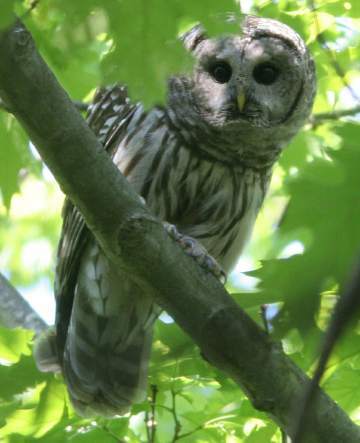 The clinic gets about 60 barred owls a year, according to Dr. Mark Pokras of Tufts. People usually bring them from places within 20-30 miles of the clinic. These owls have typically been hit by cars while hunting or feeding along roads at night. How does a barred owl, with its vigilant habits and sharp senses, end up getting hit by a car? Dr. Pokras explained that once a predator gets its senses trained on a prey animal, it focuses so intently that it tends not to notice anything else, including a vehicle bearing down on it. He also noted that our highway system creates what amounts to “predator attraction zones” consisting of strips with short, mowed grass and plants bearing seeds and berries. 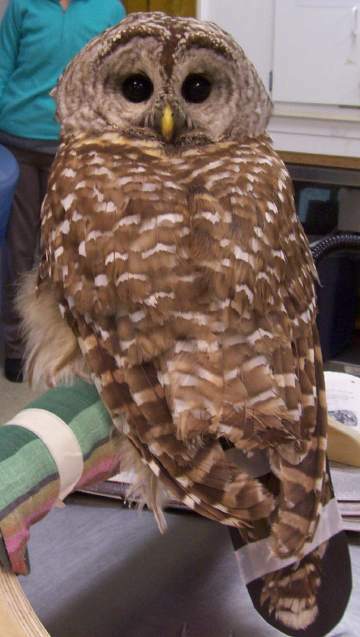 These areas are good places for mice, rabbits, and other favorite prey of barred owls, red-tailed hawks, and screech owls, which are the three birds of prey most commonly seen at the Tufts wildlife clinic. If the grass were allowed to grow taller, to 1-2 feet high, these strips near highways would be less attractive to birds of prey, he said. At this time of year, barred owls seek out holes in tall trees for nesting, but they’ll occasionally use an abandoned stick nest, such as a hawk’s nest, or even a nest box. They do little in the way of nest-building. Their need for tree holes helps to keep them in older, more mature forests with trees that are large enough. Once they find a good nest site, they might re-use it year after year. Barred owls lay 2-3 eggs, and the female incubates them for about a month. The young stay in the nest for 4-5 weeks and then move out – but not too far. They perch on nearby branches, where the parents keep feeding them and often hunt day and night to bring back enough food. The little owls get around using their beak and claws and can even climb back up a tree if they fall out. When they’re 10-12 weeks old, the young owls start to fly and eventually follow the parents around. Finally, at 4 or 5 months of age, when they can hunt for themselves, they leave the area, usually around the end of summer. Barred owls look quite similar to their west-coast relatives, spotted owls (Strix accidentalis), which have become well-known as controversial symbols of conservation (versus the logging industry) in the dwindling old-growth forests on the west coast. Barred owls have barring or streaking on their chest and throat, where spotted owls have spotting instead. Unfortunately, as barred owls have spread from the east into the west, they have added to the spotted owls’ plight because they tend to out-compete the spotted owls. Not only are barred owls somewhat larger and more aggressive, but they are also more flexible in their nesting requirements. Barred owls can nest in second-growth forests (such as those in our area), while spotted owls nest only in old-growth forests. Although barred owls get their courtship going early, they’re not the first owls to get started. Great horned owls begin in January and can be heard then. They often move into old nests built by red-tailed hawks. Spring is on the way!